The only movie that I watched in five(!!) weeks was Far from the Madding Crowd. Because there was hardly any internet to use in Spain, I choose to use it wisely. I wanted to see this movie so badly, so I was very happy that I was able to watch it after all. The story, the music, the visuals: Everything about it was perfect to me. The movie is about Bathsheba Everdene. A young and independent woman, who is not interested in finding a husband. She inherits a big maison of her uncle and this is the point where everything is changing for her. Three men are coming into her life, but all three of them approach her differently and their feelings for her are all very different as well. This leads to some unexpected events. I think this is just one of those movies that you have to see. I don’t want to spoil anything so I just want to see: go see it, at home or at the cinema, it is definitely worth the 2 hours in my opinion. Loved every second. Carey Mulligan is just a wonderful actress and all her opponents as well. 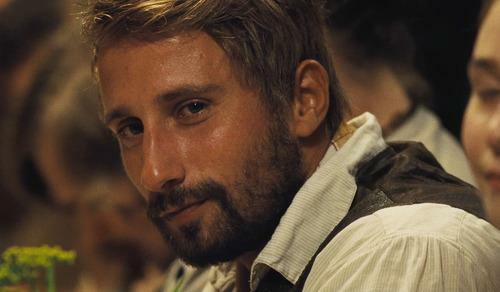 I especially like Gabriel Oak, played by Matthias Schoenaerts. These two actors make you totally feel the story. My favorite songs from the movie: Let No Man Steal Your Thyme by Carey Mulligan (https://www.youtube.com/watch?v=UNP9fvStXC4) and the instrumental opening by Craig Armstrong https://www.youtube.com/watch?v=DrNZ-lYFM48. Yesterday I watched Suite Française and it was just so good. The movie sets place during the second world war, in a little village close to Paris. The Germans arrive and they are temporarily staying with the actual residents of the town. An officer is staying at Lucille’s home. She’s living in a big maison together with the maid and her mother-in-law. Her husband is a prisoner of war in Germany. You will see what the war means for the people in this town and how people deal with it. I just want to say that this movie was so good! The acting, the story, the music: everything fitted together perfectly. It was so touching, realistic, yet so beautiful. The movie shows that there are bad people among the so-called good people, and visa-versa: Good people among the so-called bad people. If want to know what it was like to live in a time like this and watch all the drama and emotional experiences, you will love this movie as much as I did! Suite Française definitely belongs to one of the better films I have seen recently. The piano music is also just stunning, and makes this movie even better. In the trailer from 1:21 on; pure perfection.